The story of warring bacterial armies started as a Georgia Tech research published in February. Now it's a nationally distributed podcast produced by the National Science Foundation (NSF), and you can thank the researchers' unique mix of biology and math for inspiring NSF to tell the story widely in this format. "The Discovery Files" recently highlighted the work of Brian Hammer, Will Ratcliff, Samuel Brown, and Peter Yunker in a 90-second radio feature titled "A Gut Reaction." The podcast is based on a paper published on Feb. 6, 2017, in the journal Nature Communications. The researchers used math and physics equations to find patterns and consistency in how two competing armies of cholera bacteria attack each other. 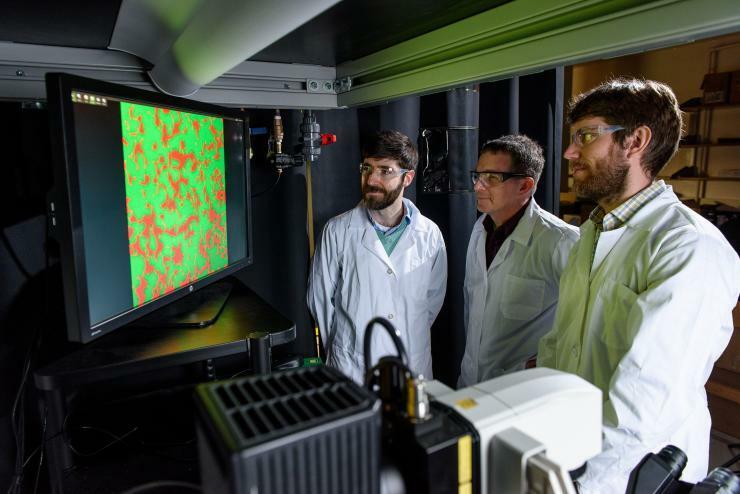 The work could someday help scientists develop targeted therapies using engineered microbes that could kill infectious, harmful bacteria while sparing helpful ones. NSF, which helped fund the research, creates a weekly audio report on the latest scientific research. "The Discovery Files" airs on radio stations throughout the U.S.
You can listen to "A Gut Reaction" here. Hammer and Brown are associate professors in the School of Biological Sciences. Ratcliff and Yunker are assistant professors, respectively, in the School of Biological Sciences and the School of Physics.